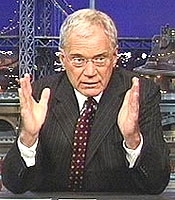 OCTOBER 15--A Connecticut judge today released search warrants for the house and car of the man accused of trying to extort $2 million from David Letterman. A copy of the warrant executed October 1 at the Norwalk home of Robert Halderman can be found here (an identical warrant was secured for Halderman's Honda Accord). The document provides an overview of the police investigation of Halderman, a CBS producer who allegedly sought to blackmail Letterman, 62, over the TV star's sexual dalliances with members of his staff. Superior Court Judge Bruce Hudock ordered the release of the warrants with minor redactions. Included in the unsealed records was an inventory showing what investigators removed from the Renzulli Road home Halderman shared until recently with Stephanie Birkitt, a Letterman assistant who reportedly had an affair with the "Late Show" host. Along with computer equipment, a camera memory card, and a "MY Magazine w/Letterman," cops seized bank records, two copies of a check, and a "Suspect/Attny agreement."